LOS ANGELES — Three UCLA basketball players detained in China on suspicion of shoplifting returned home, where they may be disciplined by the school as a result of the international scandal. PARIS — French investigators have released a chauffeur for Kim Kardashian West and two other people in their probe into the robbery of more than $10 million worth of jewelry from the star’s Paris apartment in October. ORWIGSBURG, Pa. — A couple who helped steal more than $175,000 from a grocery store where they worked used that money to buy a winning $1 million lottery ticket from the same store, state police said. LOS ANGELES — A water district has sued Tom Selleck, claiming the star of the crime shows “Magnum, P.I.” and “Blue Bloods” stole truckloads of water from a public hydrant and brought it to his ranch in drought-stricken California. 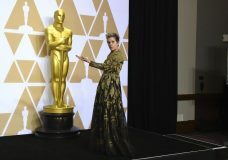 LOS ANGELES — The theft of a $150,000 pearl-covered gown worn by Lupita Nyong’o at the Oscars doesn’t surprise Hollywood stylists who have personally experienced the seedy side of red carpet fashion. LONDON — The producers of James Bond films say an early version of the screenplay for the new movie “SPECTRE” is among the material stolen in the massive cyberattack on Sony Pictures Entertainment. Malaysian authorities say a banker and her husband stole thousands from passengers on board missing Malaysia Airlines Flight 370.